"41UR315, Burial 18, Vessel 84" by Timothy K. Perttula and Robert Z. Selden Jr.
DECORATION (INCLUDING MOTIF AND ELEMENTS WHEN APPARENT): The rim panel has an engraved scroll motif repeated five times around the vessel. The scroll is comprised of a sideways negative S-element outline by cross-hatched negative ovals in the upper and lower scroll fill zones. Each scroll is divided by hatched vertical brackets. Ripley Engraved, var. 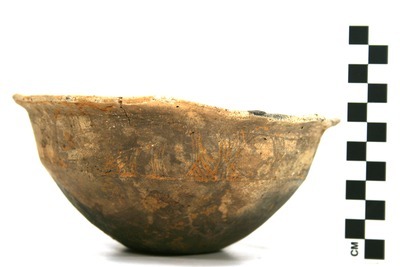 Gandy carinated bowl, Burial 18, Vessel 84.